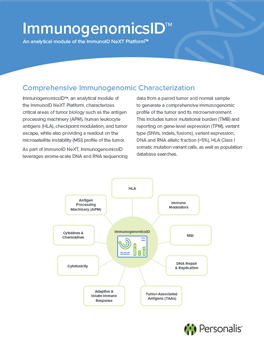 ImmunogenomicsID, an analytical module of the ImmunoID NeXT Platform, characterizes critical areas of tumor biology such as the antigen processing machinery (APM), human leukocyte antigens (HLA), checkpoint modulation, and tumor escape, while also providing a readout on the microsatellite instability (MSI) profile of the tumor. As part of ImmunoID NeXT, ImmunogenomicsID leverages exome-scale DNA and RNA sequencing data from a paired tumor and normal sample to generate a comprehensive immunogenomic profile of the tumor and its microenvironment. This includes tumor mutational burden (TMB) and reporting on gene-level expression (TPM), variant type (SNVs, indels, fusions), variant expression, DNA and RNA allelic fraction (>5%), HLA Class I somatic mutation variant calls, as well as population database searches.